So, you bought a camper. No, really, you bought a camper! Seriously, get excited because you are joining a great community and there are some seriously awesome times ahead of you! But first, you need gear. Yeah, a lot of gear. Don’t worry! We have you covered. We bought our first camper back in March 2016, took two weekend break-in trips in it, then took it on the road for 38 days straight. 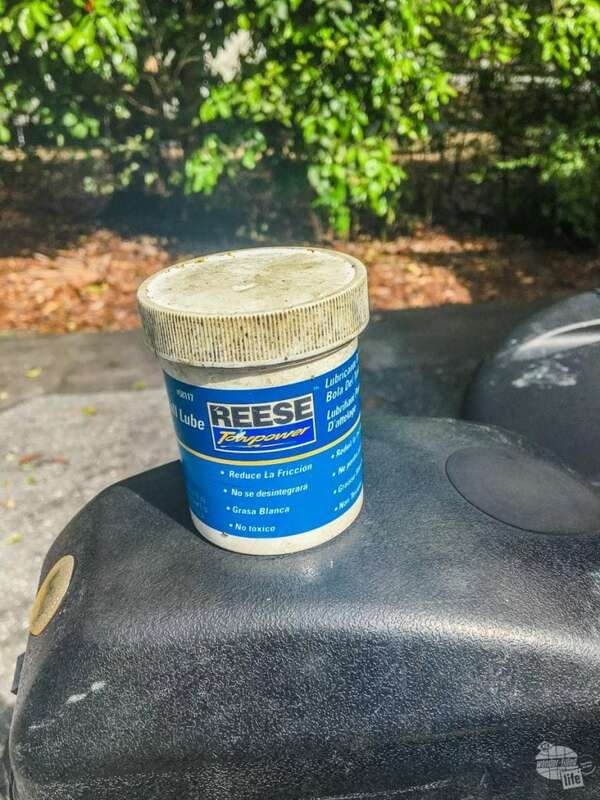 We have spent the past three summers taking our camper all over the country and this is the stuff we use and love. 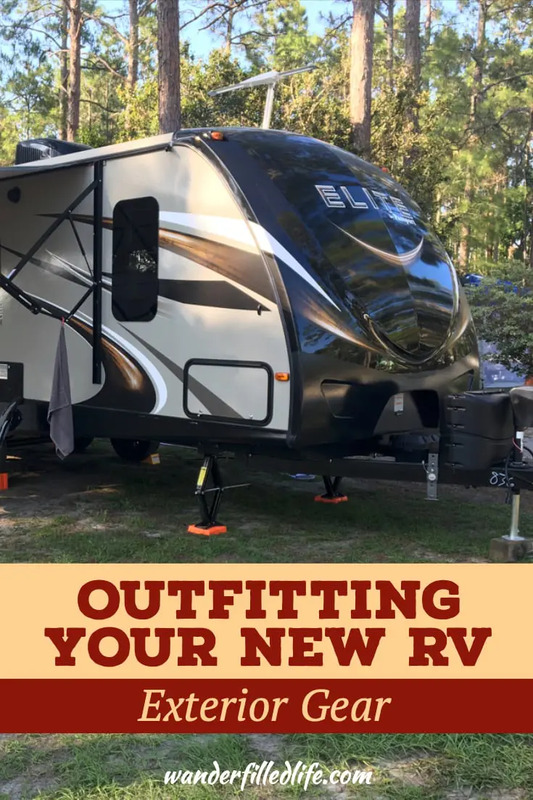 First and foremost, let me give credit where credit is due… I did the same thing you are doing when I first got my camper… I got online and Googled how to outfit a new RV. Warren Petkovesk’s article on This Old Campsite came up and I started buying stuff off the list. 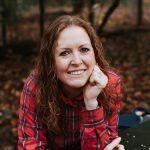 Instead of forcing you to have to find out what works best for the RV and go search for a place to buy it, I have compiled a gear list for you and linked it all to Amazon. In general, we shop a lot at Amazon. We have Amazon Prime for two-day shipping (and movies… more on that in another post) and we have the Amazon Prime Rewards Credit Card, both of which we love. When you combine the two, you get 5% off your purchases at Amazon and the added bonus of 2% back at gas stations. Your hitch is one of the most important pieces of gear you can get. Keeping everything about your hitch working properly is one of best ways of reducing headaches. Hitches for a travel trailer are very much a matter of personal preference. I suggest most folks towing a travel trailer should get some sort of weight-distributing hitch with sway control. It helps keep the back-end of your truck from sagging and keeps the trailer from swaying all over the place. I use the Husky Centerline TS. It is fairly easy to use, does not need to be disconnected when making tight turns and has worked like a champ for us. That said, there is plenty of discussion in RV forums on other brands out there. The reason I have this particular hitch? 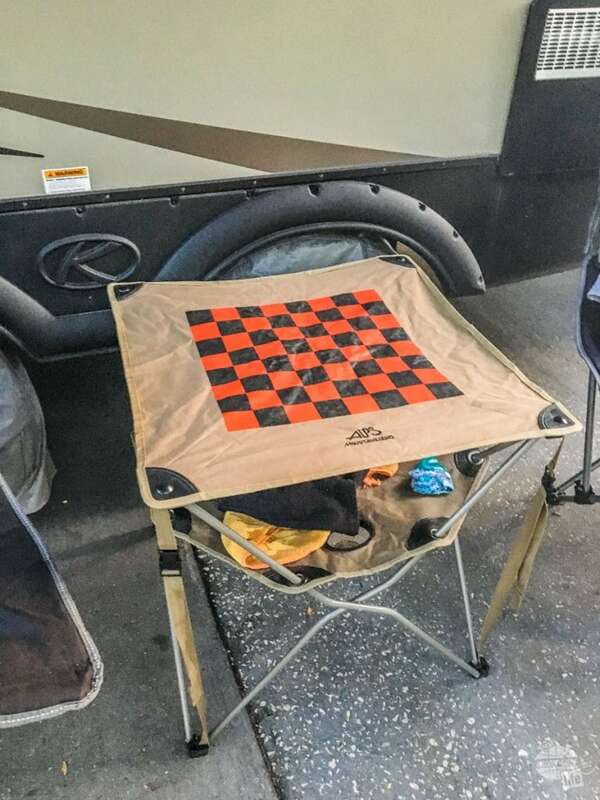 This is what the dealer I bought my camper from carried and I got them to toss it in the price! Regardless of which hitch you get, get some hitch lube! I use Reese Towpower Hitch Ball Lube. It reduces noise and keeps everything moving smoothly on the various components of the hitch. Be sure you follow the manufacturer’s instructions on what to lube! Once you lube up your ball, you are gonna need to cover it to keep from smearing the lube on your clothes, etc. You can read all the innuendo you want into that comment, too. My wife and I call this thing the ball condom. 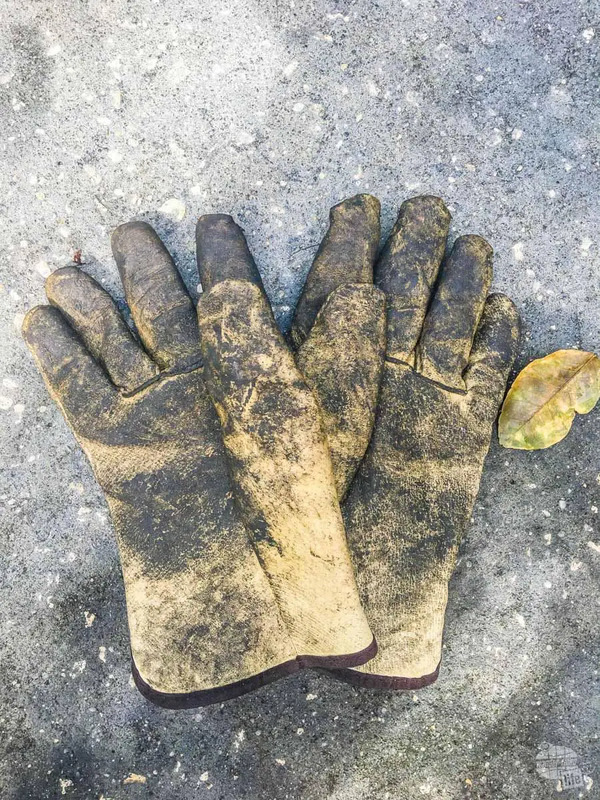 Work gloves are mighty handy for keeping your hands clean and not torn up. Trust me on this, you are gonna want leather work gloves when it comes to dealing with the hitch, among other things. 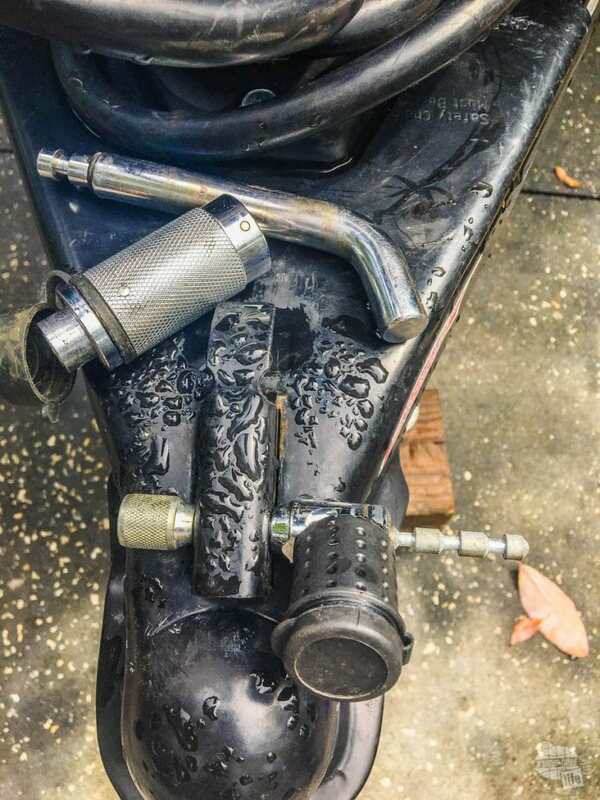 The hitch is heavy and it will tear up your hands, plus the grease is, well… greasy. So, you bought your beautiful new trailer and expensive hitch… Are you really going to leave them unlocked when you park it? Nah, didn’t think so. I have never actually used the products I am linking to, but the ones I have are very similar and I will probably replace them with this set. Why? Because one key is better than two keys! Tires keep you rolling (pun intended) and you both need to take care of them and prepare for their failure. 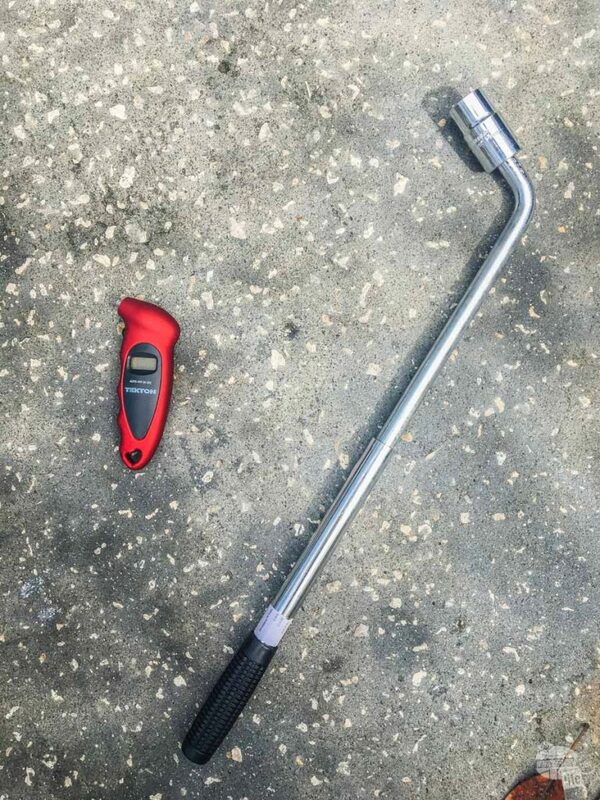 First and foremost, get yourself a decent tire gauge. You will need it, period. Next, get yourself a lug wrench that will actually do something. This is the one I have in my truck right now. We have not had to use our Trailer-Aid yet, but we are glad we got it. Why haul around wooden blocks or extra strength bottle jacks to change a flat on your trailer when you can just pull the trailer up on to a wheel block? These are simple reflective caution triangles you use if you break down on the side of the road. It’s a small price to warn someone before they plow into your trailer. 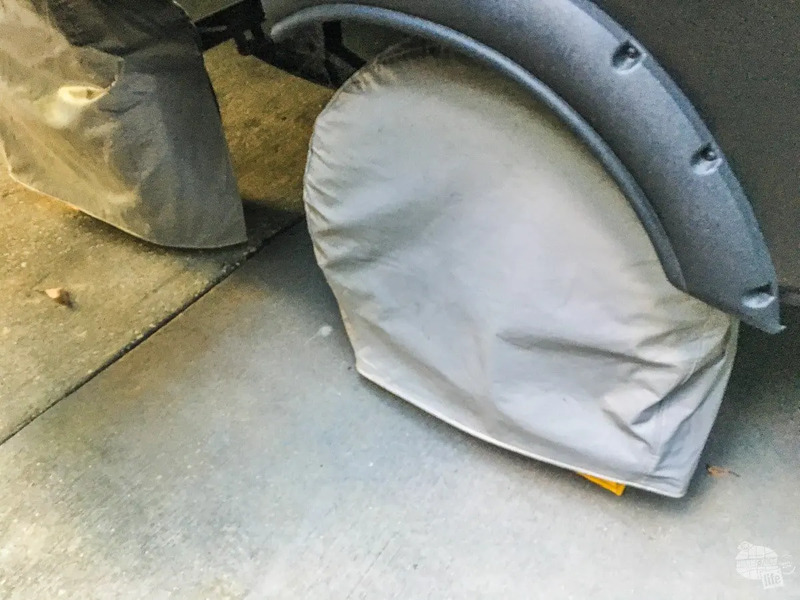 If you are going to be storing your RV for any period of time, you want to protect the tires with covers. These go on easy and fold up just as easily. 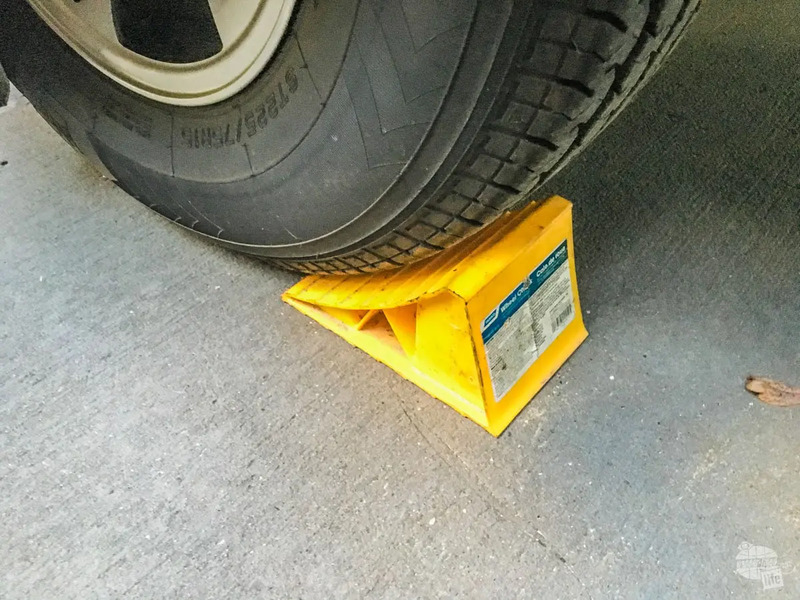 These are simple, yellow chocks that will keep your trailer from rolling. Get four of them (two packs of two). 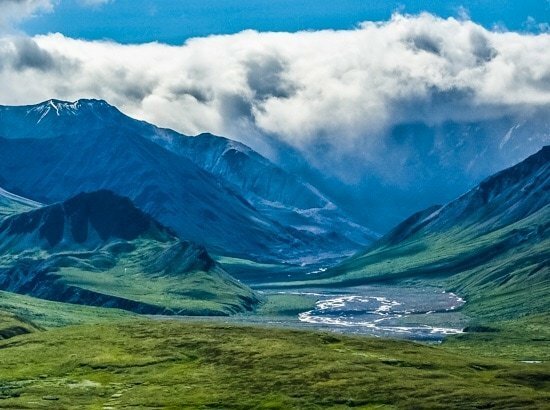 It does not matter how much the campground advertises having level sites, they won’t be. You will need to level your trailer at least a little pretty much every time you camp. Sometimes, it will be easy. Sometimes, it will be hard. These gizmos will help make the process better. Ok, so the first time you level your camper, you are going to want to use nice carpenter’s level to make sure it is squared away. Once you do that, stick these guys on the outside of your camper, near the front. They will tell you how many inches the camper needs to come up in order to be level. Once you figured out how much you need to level, lay these bad boys down and drive the trailer up on to them. The cool thing is one layer of them is one inch on the level. It takes a lot of the guess work out of the process. I know some guys will just haul 1”x4” scraps to level with, which I am not a fan for a few reasons: 1) these guys are plastic and won’t rot and 2) they work like LEGOs and won’t slide. I suggest three bags of 10 of these. We started out with two bags and ran out in a couple of places leveling our camper and supporting the stabilizing jacks our first year. For the last two summers, three bags has done the trick. 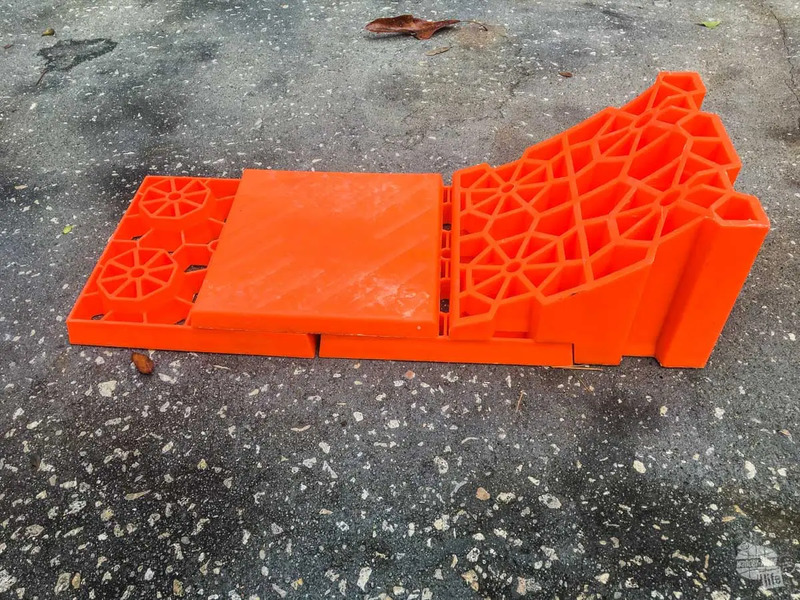 Lynx Caps go on the levelers to protect the “LEGO” connectors and are great as stabilizer pads and can be used by themselves. Despite saying they do not add any height to the leveling stack, they add a bit and can be used by themselves for leveling. That said, with the above levels and a cap, the “one level for one inch off” rule may be not quite exact. With a little practice you’ll learn to read the gauge and determine what you need. Get two packs of four. 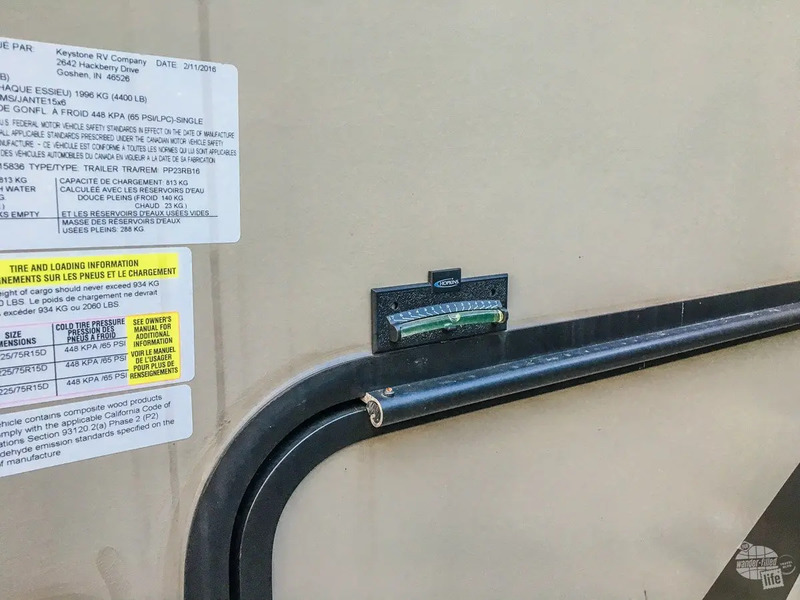 Stop n’ Chocks link into the Lynx Leveler to secure your trailer on the levels. Get one pack of two. I have a total of four and never use the other two. I can’t tell you how much time this little gizmo, combined with a cordless drill, will save you. You put this in your drill, then the stabilizer jacks go up and down in seconds. We saw a poor guy in Baker, NV putting down his scissor jacks by hand in 100+ degrees. I went over to help him out with my drill only to discover the scissor jacks on his camper did not have a drive nut. My recommendation: if you have a camper that has jacks without a drive nut, pay to have them replaced with ones that do. This one trick will save you so much sweat. 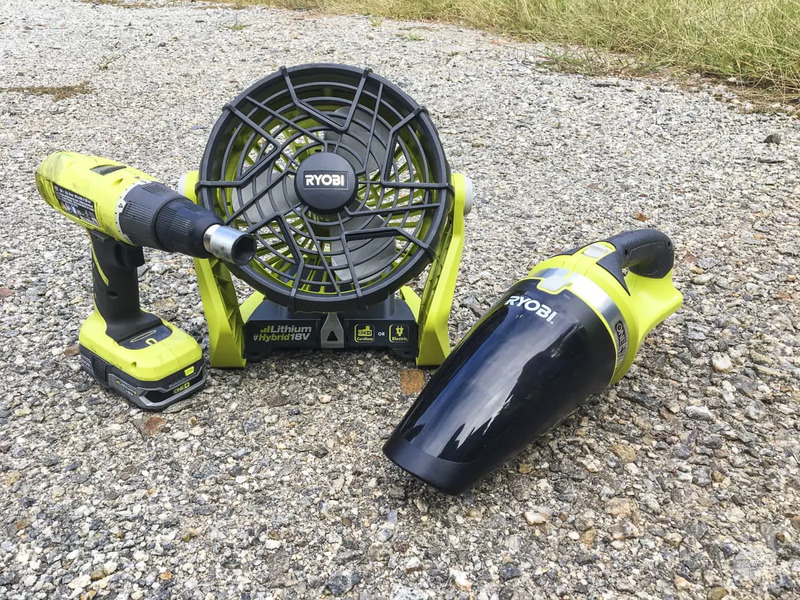 We really like Ryobi One+ gear from Home Depot for our camper. The system all uses the same rechargeable batteries, can easily be found at most Home Depot stores and there a bunch of useful tools for a camper. That makes finding a replacement or additional battery easy. I have included links to Amazon to make shopping easier for you, but you can likely get these cheaper at Home Depot. I got this drill, a bare-bones model I picked up at Home Depot. It lives in the camper and I rarely use it for much more than driving the scissor jacks, but I have a bit kit just in case I need it. I also have a portable fan which runs off either batteries or an outlet. This is great for boondocking (camping without connections) when it is a bit hot at night. Both of these are great additions to any camper. Need a hand vac? 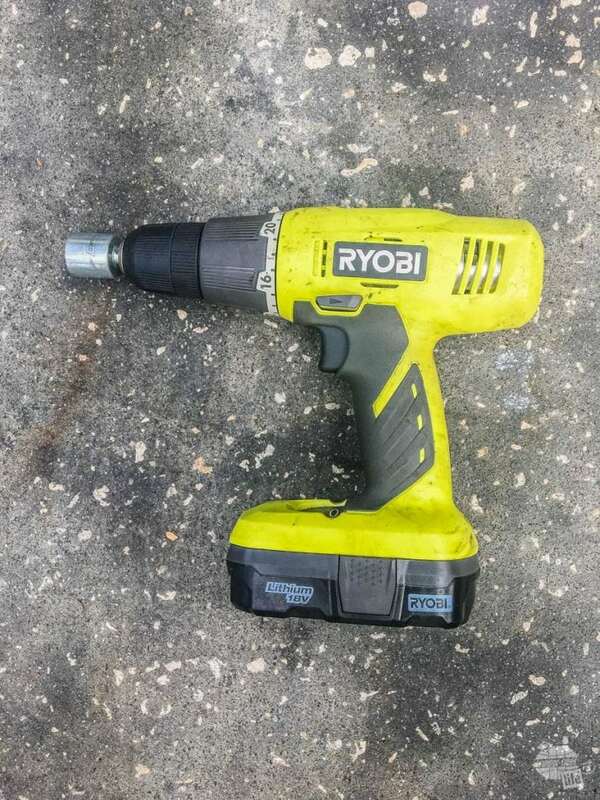 Ryobi makes those, too. We have that plus we got a handheld air compressor to be able to top off tires. Yes, it has enough juice to inflate the tires on the camper and is great for making sure they are full before a long drive. All run on the same batteries and charger, which makes it quite convenient. 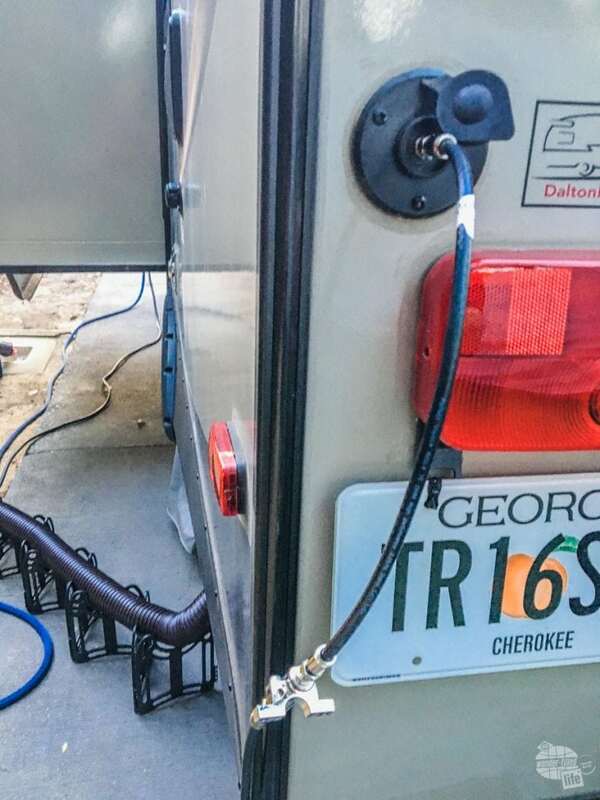 Your camper relies on the electricity you put into it, so don’t skimp on the gear you use to connect your camper to the pedestal. If your camper did not come with one, you will need one in the correct amperage, either 30 or 50 amps. We have a 30 amp camper, so I will be picking up a power extension cable just in case. We almost needed one at a site in Nashville. The pedestal was at the back and our power connection is close to the front of the camper. I really need to get one of these myself. 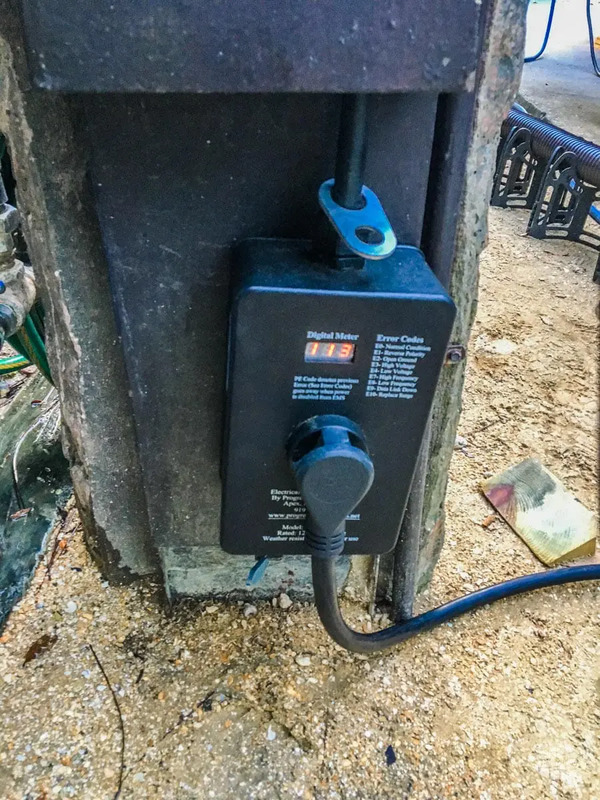 Like the hitch, power management is a source of serious debate among RVers. There are a few different brands, each with their plusses and minuses. We ended up buying the Progressive Industries model and it has been great so far. Basically, the device works like a surge protector for your camper. It analyzes the power coming from the pedestal, looking for all sorts of electrical problems. The best part for me is the lifetime warranty. Our model actually failed on us. It was working just fine, caught a low voltage problem at a campground. Then, a few nights later, it just stopped letting electricity through the unit. It would analyze the power, not give any error codes, but no juice was going to the camper. We called Progressive, spoke with Anthony DeMaria, who FedEx’ed a new unit to us to our campground in Bar Harbor. Seriously, you can’t beat that kind of service! I have linked to their most up-to-date model. Dog bones for adapting to power at different amperage. A dog bone is not something for your pet. It is a plug adapter for your camper. Let’s say you are out on the road, no reservation, just going to stop at an RV park along the way. You get there and they have a spot, but only a 50 amp connection for your 30 amp trailer. What do you do then? You pull out the dog bone and plug right in! Since I have a 30 amp camper, I have two: I have a 50 amp to 30 amp and a 15 amp to 30 amp, covering the two different plug types out there. You will need to get the dog bones that work for your camper. One thing to bear in mind: a dog bone is just a plug adapter. It will not magically make more power come out of a lesser connection. You will not be able to function normally on a 30 amp connection if you have a 50 amp RV. Typically, that means you will not be able to run A/C, which is often the biggest power draw. If your camper has a cable connection, you might as well have some coax cable to take advantage of the cable at your campsite. I suggest a 25-foot length and a one-foot cable for using an in-line surge protector. You protected your main electrical system from getting zapped, but make sure you protect your TV, too. Connect this to the shorter coax cable on the exterior of your camper and then to the connection to the park. Just like electricity, water is essential to the good operation of your camper… Keep it fresh and clean. Let’s talk water connection. First things first, you will need a water hose. But not just any water hose. You need a food grade water hose. These are typically white or blue. I suggest at least 35 feet of hose. Indeed, on our second trip, I had to drive half an hour to the nearest Wal-Mart to get a second water hose because we didn’t have a long enough hose. Originally, we had a standard white rubber hose for our water connection, but the collapisble hose I use for flushing is so convenient, I looked for a similar hose for drinking water. Once I found one, I was hooked! This is seriously one of the best upgrades I have gotten for the camper after our first major trip. This is so much easier to use than the hose above. Yes, it costs more but is well worth it in terms of hassle and space it takes up. GET THIS HOSE! This is a must. You don’t know what the water pressure is at the campground you are going to. It could be 120 psi. Your camper, on the other hand, only needs 40-50 psi. 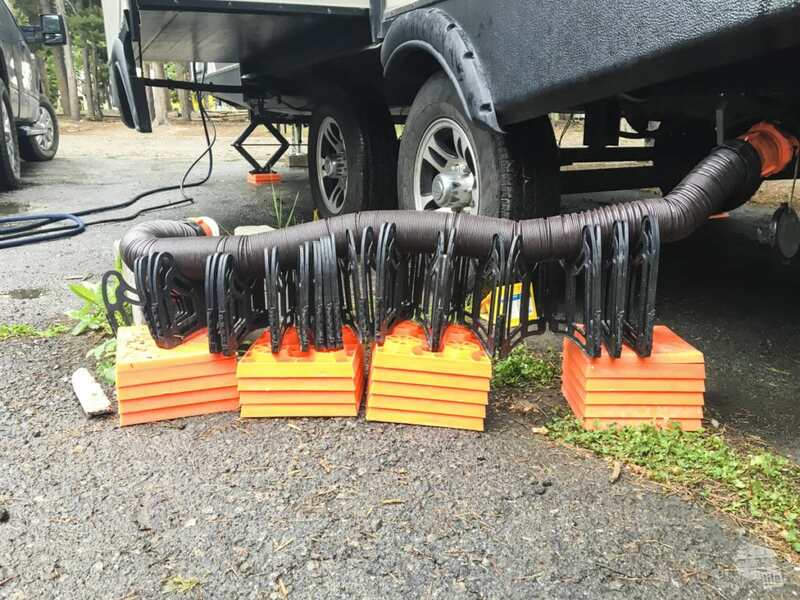 Pro tip: connect this to the campground’s water supply, then connect the filter, then connect the hose, which will connect to your camper. Here’s why: the pressure will build up at the regulator, but will be reduced on the other side. You don’t want your components (hose and filter) dealing with additional pressure. That will lead to hose failure a lot faster. See the picture above. There are several different systems you can use for a water filter. There are some campers that have the filters built into their system. If you are not full time, this is a good, easy to use and replace filter. One thing I like about this filter is you can easily find it at Wal Mart if you need to replace it on the road. Every camper is different and some have funky sewer connections, but this gear works for me and is the most common stuff I have seen out there up to this point. The first thing you want to buy is a sewer hose kit. This kit has just about everything you need to get started. Get the 20-foot kit. It comes with a 10′ connecting hose and a 10′ extension hose. Most of the time, that is all you will need in terms of connecting to a sewer hook up. I have linked to their new, improved model which has a clear elbow connection. 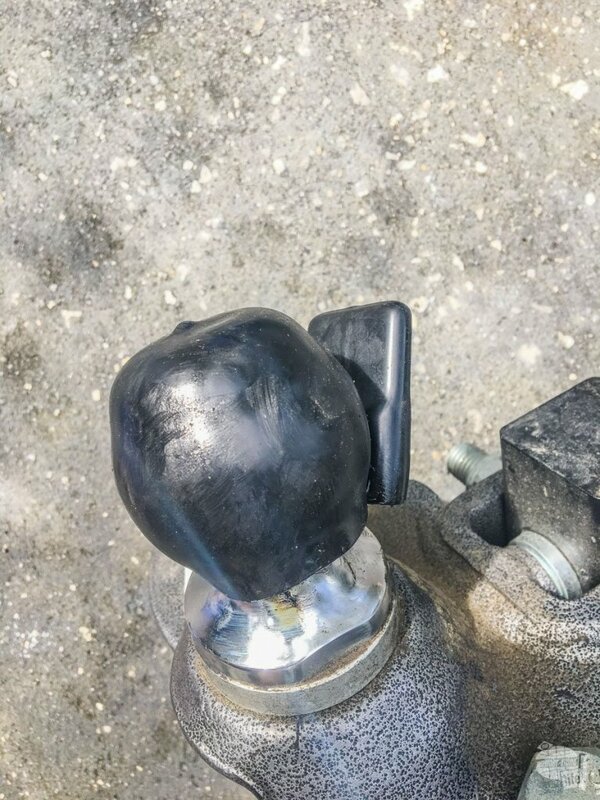 The only thing you may want to add, if you are often connecting to a campground that has a wider than normal or unthreaded connection, is a rubber donut. I have not needed one yet, but I might get one to toss in there just in case. 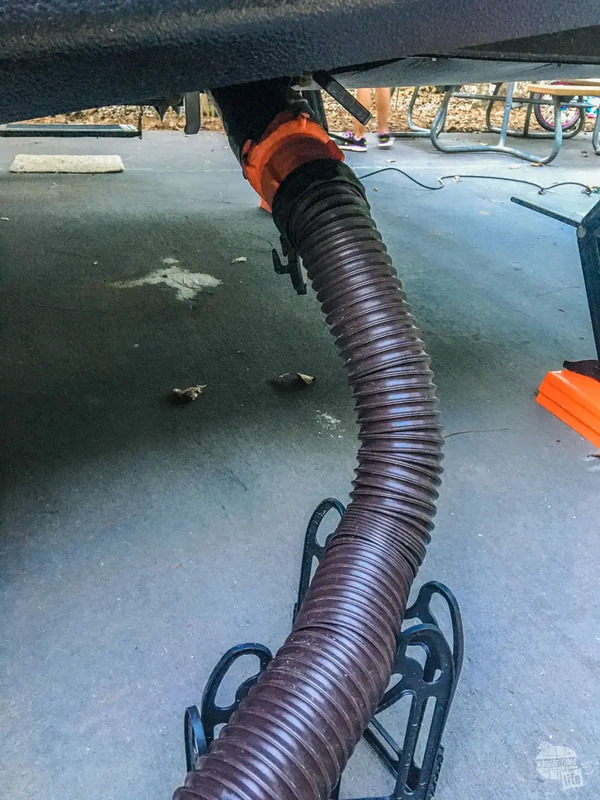 Typically, the sewer hose connection is a few inches above the ground and you want a smooth flow into it. 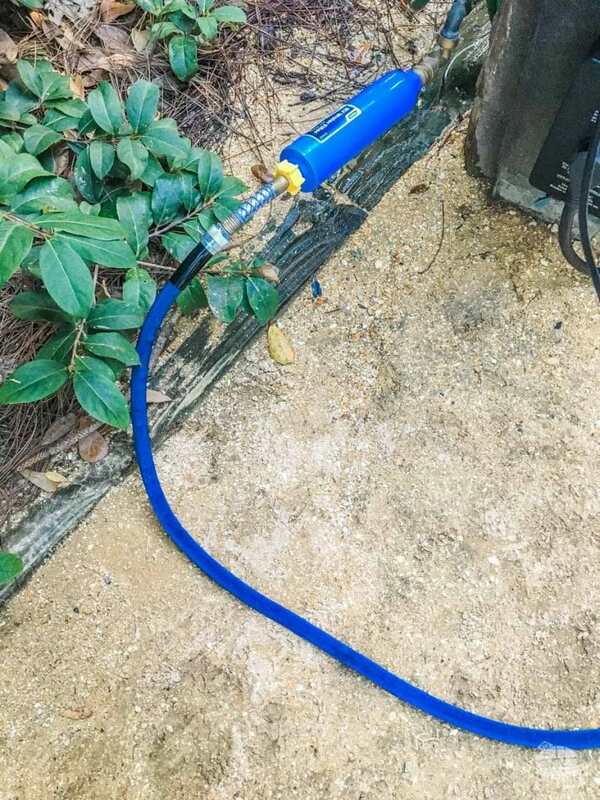 This will allow the hose to run smoothly over uneven ground to the sewer connection. I recommend getting the 20-foot support. 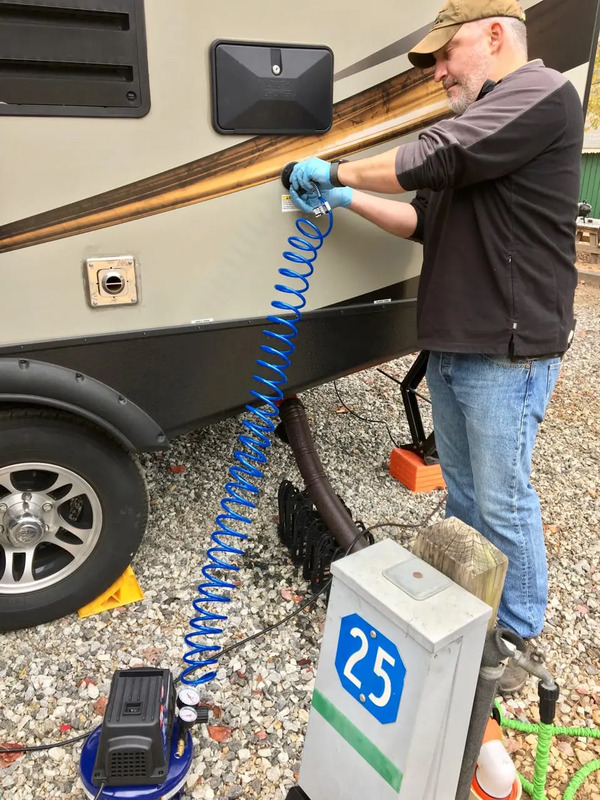 Pro tip: Sometimes your Lynx Levelers will come in real handy when doing a sewer connection, like when we stayed at Fishing Bridge RV Campground in Yellowstone National Park. Sometimes, you have to improvise, adapt and overcome! Sometimes, you need to improvise to have a good sewer connection. In this case, having plenty of Lynx Levelers really helped out. 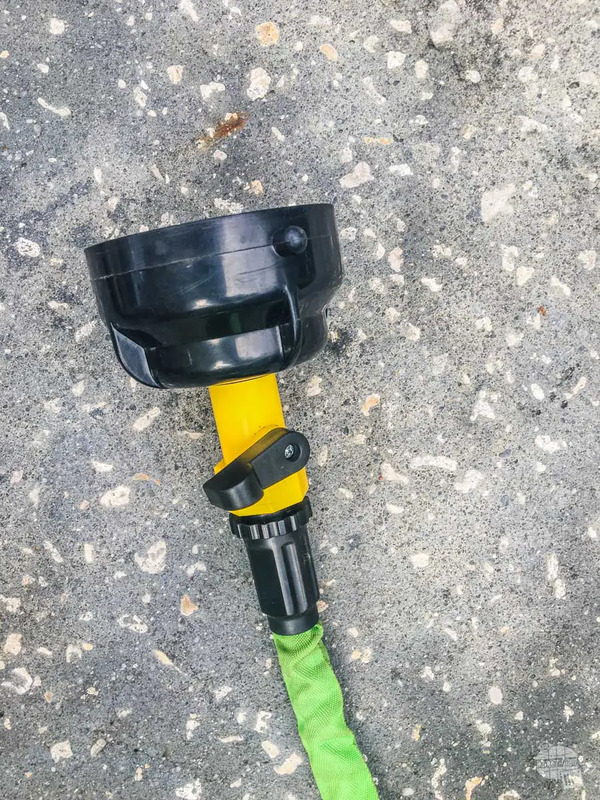 This attaches to a sewer hose for easy flushing. I can’t begin to tell you how much I love this thing. Most of the time, it is attached to my secondary hose (see below). So, you drained your black tank and your gray tank and now you are ready to rinse that sewer hose out because who wants to travel with funk in your hose? Just attach this to a generic hose, turn on the water, uncouple your sewer hose from the camper and couple it to this adapter. Turn on the valve on the adapter and voila! No mess. No fuss. You do not want to ever use your fresh water hose to do any sort of cleaning, much less cleaning your sewer hose. Yes, you can get a cheap garden hose to use when you clean the sewer hose, flush the tank or spray down the camper, but this is so much better and takes up a lot less room. While you won’t need it right away, you will need some equipment to winterize your camper. There are a couple of different methods. 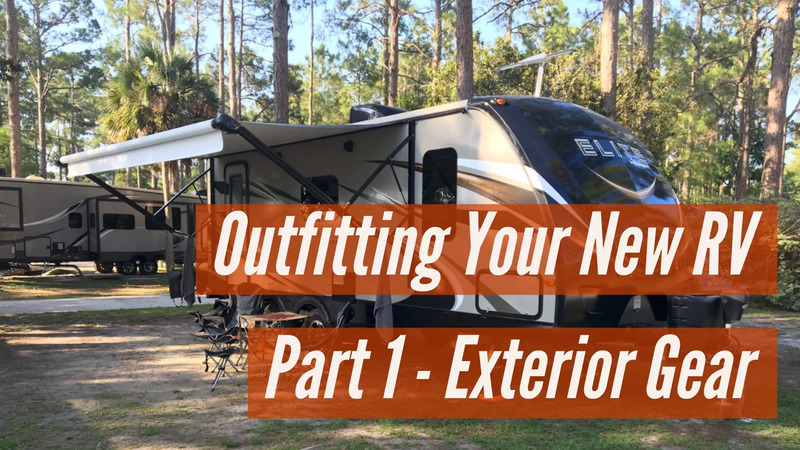 For how we winterized our camper, be sure to read up on it here. This air compressor, along with a couple of adapters, made winterizing our camper a snap. I got a small, pancake-style air compressor which would store easily in the camper. The idea is, using an adapter, you blow all of the liquid out of the lines. This worked like a charm. While it is loud, this is not something you should need to use all the time. 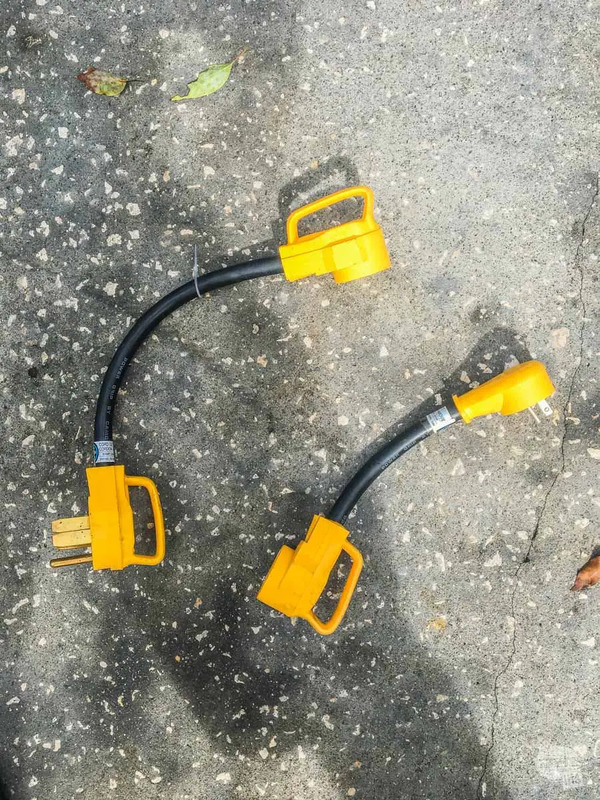 Camco makes a great adapter to use with your air compressor to blow out the lines. You will need a quick connect adapter, but you can easily get those at Wal Mart or The Home Depot. 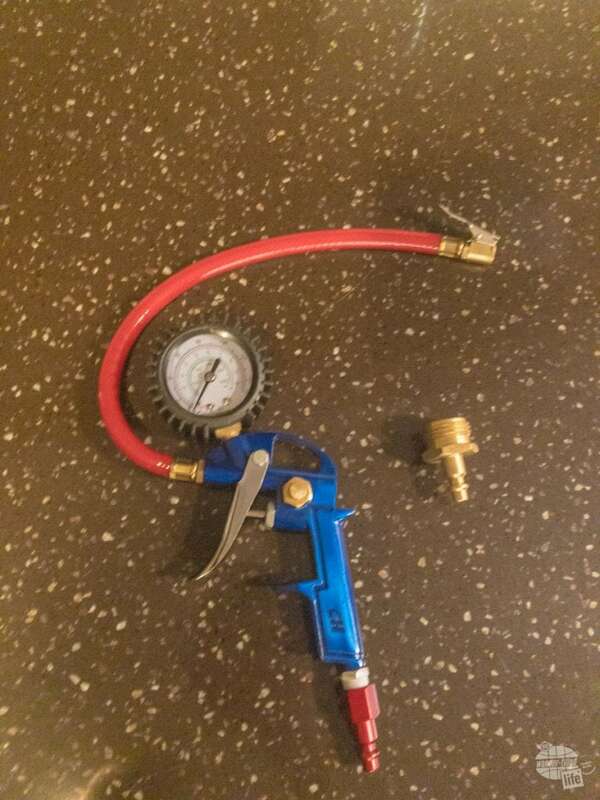 If you are getting an air compressor for your camper, you might as well get an adapter to inflate the tires on your camper, too. This is gear I keep in my pass through storage that just makes RV life easier. 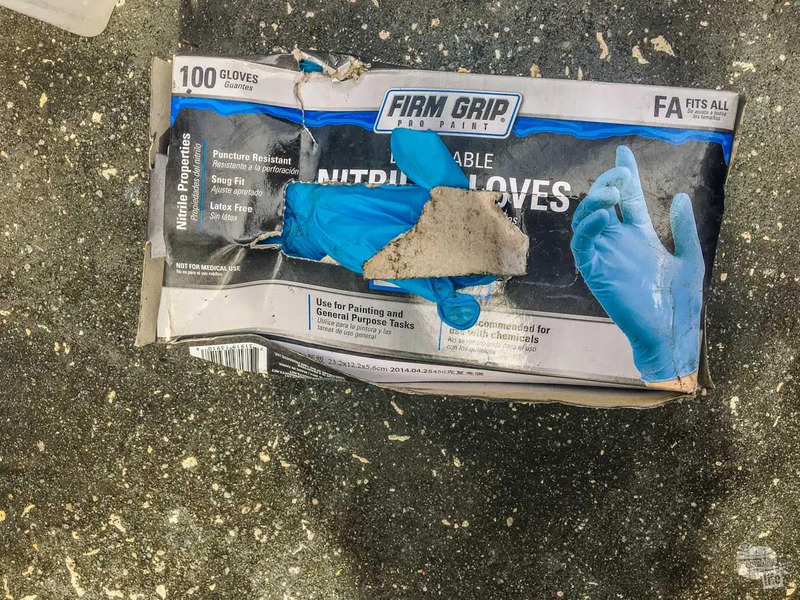 I keep a box of disposable gloves in the pass-through for two reasons: dealing with the sewer system and dealing with the ball lube. Once I am done with both, take them off and throw them away. I probably picked up the above box at Wal-Mart when I ran out of the linked product. Both are great. tonI tried the Camco ones which stick on to the door of the pass-through. I was not impressed in their durability for dealing with some of the more difficult jobs around the camper. I keep a box of these in the pass-through and they are great. The box itself is a little big, but we love being able to pull a couple out as needed. 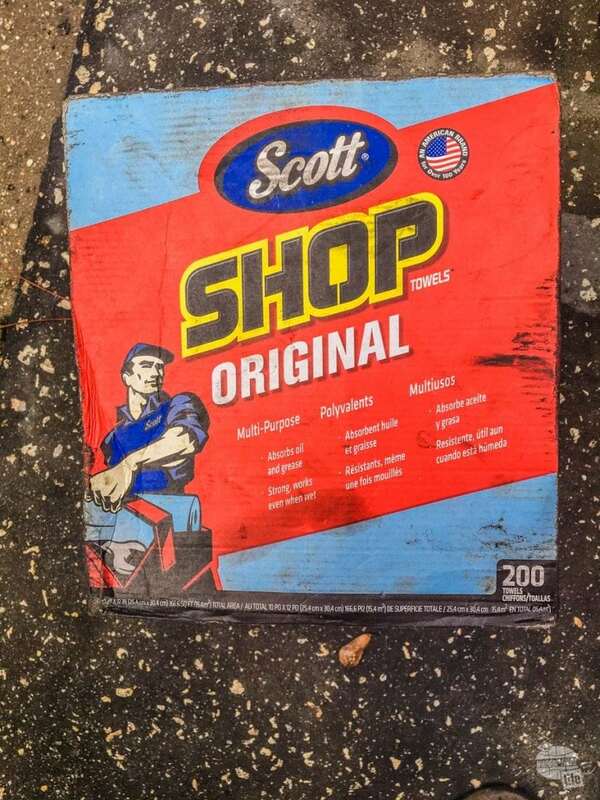 These are great for cleaning up after dealing with the sewer connection, the hitch or cleaning out the grill. I like these storage bins because the lid stays attached. 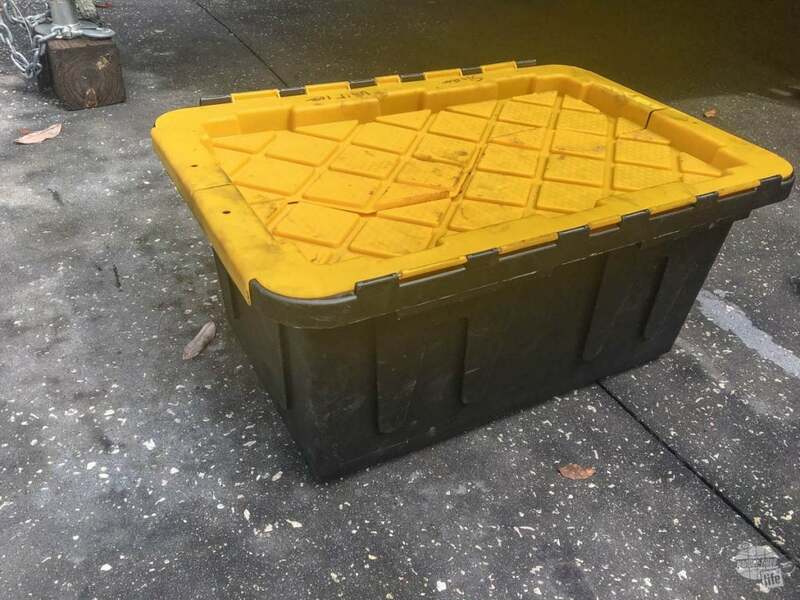 I have not used these bins in particular, but I have several just like them I picked up somewhere for just storing stuff in our storage unit. When we bought the camper and got rid of the storage unit, these started to get used for stuff in the pass through and stuff under the bed. I love the built-in lids. I keep bins for leveling gear, electrical stuff, drinking water hoses and sewage stuff. Note: I keep a lot of this stuff separate from each other. That is especially important when it comes your drinking water stuff and the sewage stuff. Don’t mix hoses or store them together! The reason I am linking these is the various sizes. Every pass through is different. Measure yours and get the bins that fit your compartments. Every RV needs a basic tool kit. Like the bins, I don’t own the linked kit, but it is a pretty close approximation of what I do own. 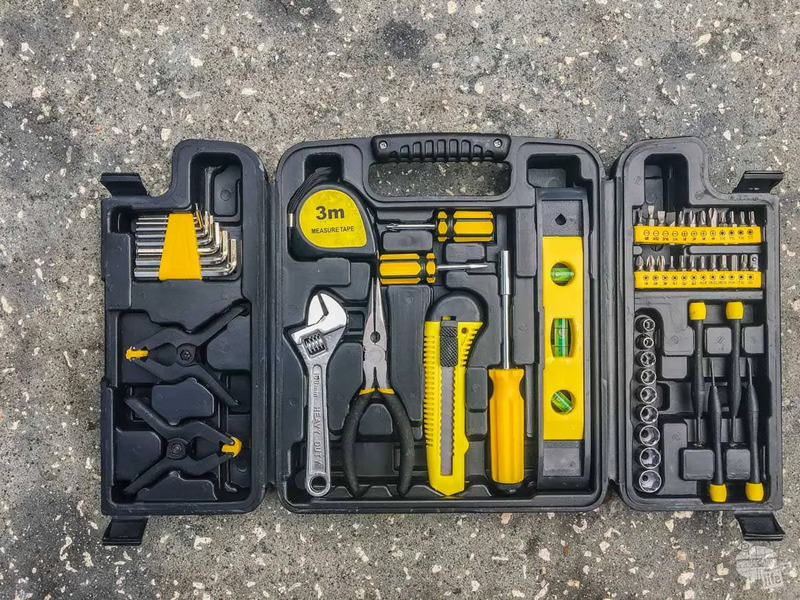 You don’t need to keep a ton of tools in your camper but something like this will help you solve most problems you run into. The only tool I really feel is missing from the kit is a pair of vice grips. I had to use those to separate my pressure regulator from one that the campground put on the spigot. Grant grilling pork chops at the Charbonneau Campground! My camper has one built in, but there are plenty of good grills out there for campers. Back when we were tent camping, we had this great tabletop grill, made by Coleman. They make some other really good portable grills which use the very easy to find 16.4 oz propane bottles. 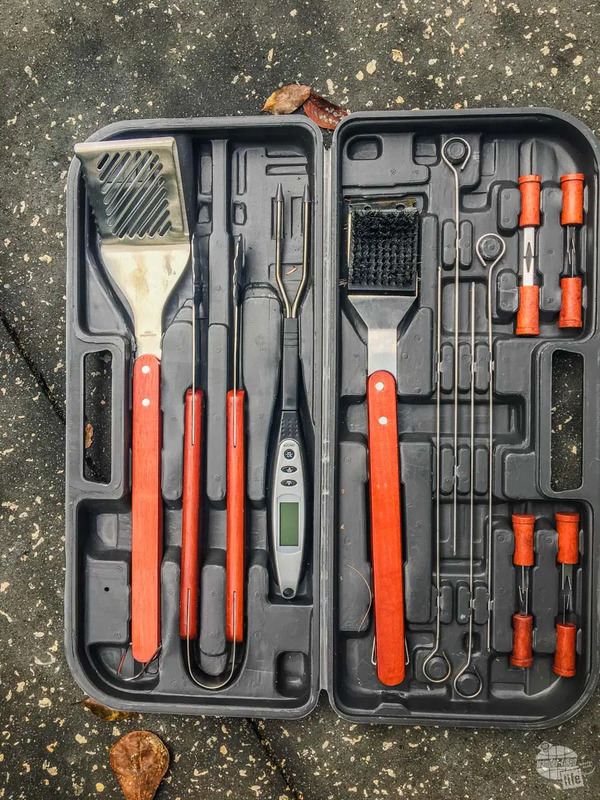 The grill tools I have are suited for a grill without a nonstick coating (the one above has one… use plastic tools on it). This one is very similar to the one I have that lives in my pass through. Bonnie reading a book on her iPad at the camper. 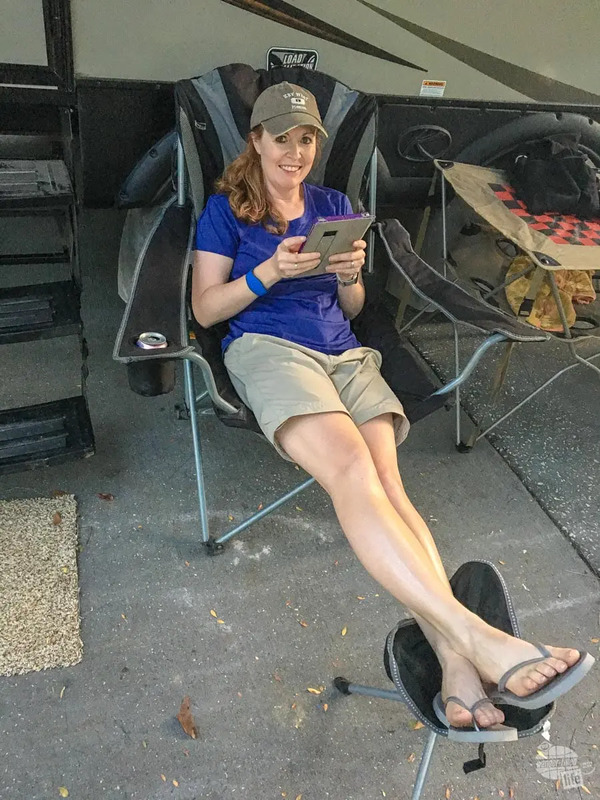 You are gonna want some camp chairs so you can enjoy the outdoors (otherwise, why are you in a camper to begin with?). If you have a large motor home or fifth-wheel, there are some amazing folding chairs that will fit in your storage areas with no problems. For us, in our travel trailer, we need chairs that fold down smaller but still provide serious comfort. We have had these chairs from Picnic Time for a few years and love them. They are very comfortable and, combined with these footrests are just about perfect. Having a table to set things on is always nice. This table from ALPS Mountaineering has been a great addition to our campsite. I got the model with the checkerboard on it, in case Bonnie and I ever decide to play checkers or chess on it. A large outdoor mat or rug to set up under your awning. A lantern…I can’t really recommend the one we have. The rechargeable battery technology is awful. Some sort of mosquito repellant… I have yet to find one I am really happy with. Be sure to check our review policy for information on the links and check out our gear recommendations for the interior of your camper. We just purchased our first travel trailer. This is excellent info. Thank you! Welcome to a great community. Please let us know if you have any questions. We are more than happy to help. Went through this a year ago. No argument on your suggestions. However, I couldn’t handle the hooking and unhook ingredients, in and out, etc. I just bought a Class C and took delivery yesterday. I set both with solar, satellite, lithium ion house battery and a 4in. bed topper. Yes, a little more investment, but it sure makes life on the road a whole lot better and more comfortable. Also, I have a multitude of self-locking plastic boxes in different sizes that I got at Walmart to store anything and everything. Also, I have a shoe cleaner that sits right by the stairs. Enjoyed your article and it is spot on! Fred, I have to say I am more than a bit jealous of the solar system you have in your Class C… That is one of my planned upgrades for our camper. We just bought a mattress for our camper and we will update the recommendations once we try it out. It was less than $200 on Amazon for a queen, so not a bad price. Thanks so much for the recommendation on the shoe cleaner. That is a really good idea. I will have to add that to our camper and the list! What mattress did you buy? Do you like it? We bought the Live and Sleep Resort Sleep Classic (https://amzn.to/2kcwmYI …that’s an affiliate link). We have only slept on it for two nights, but we love it so far! Our next road trip will start in just a couple of weeks…we’ll post more on the mattress once we’ve slept on it for a few more nights. Thank you so much for compiling this list. I wish I would’ve found this at the time we bought our trailer last year…. I believe we have everything on this list now or at least pretty close. The only difference is that it took many YouTube videos and research to find all of this stuff and get it in my trailer. These are all very good ideas and products that you are suggesting. Happy Camping. Thanks so much for this list. We just bought a 27 ft pull behind, picking it up in a week… and there are a few things I would have never thought about. Like the water pressure regulator and filter. Thanks for compiling all this info. We certainly agree any good RV dealership should walk you through and ours did, but it was a ton of information. That’s one of the reasons we wrote this article… To put that information in an easy-to-access and re-access place. 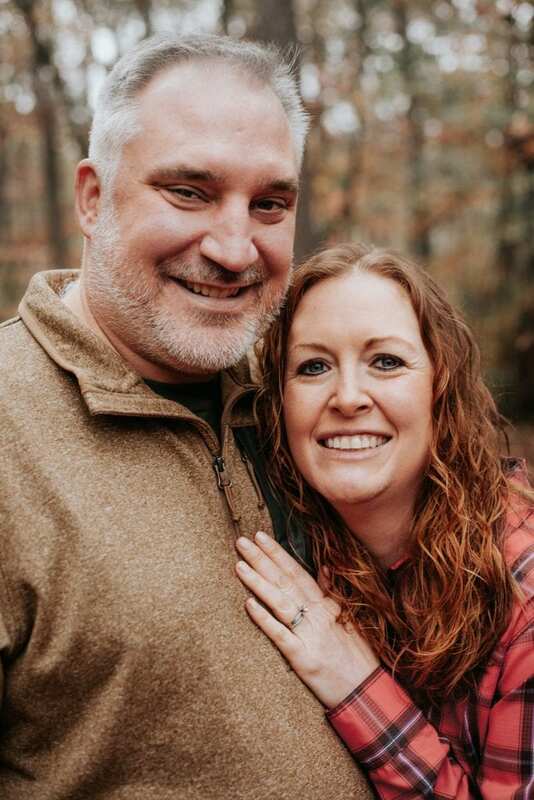 This list is great for my husband doing his set up thing, I went searching for outfitting the interior, do you have such an article, is there a Part 2? 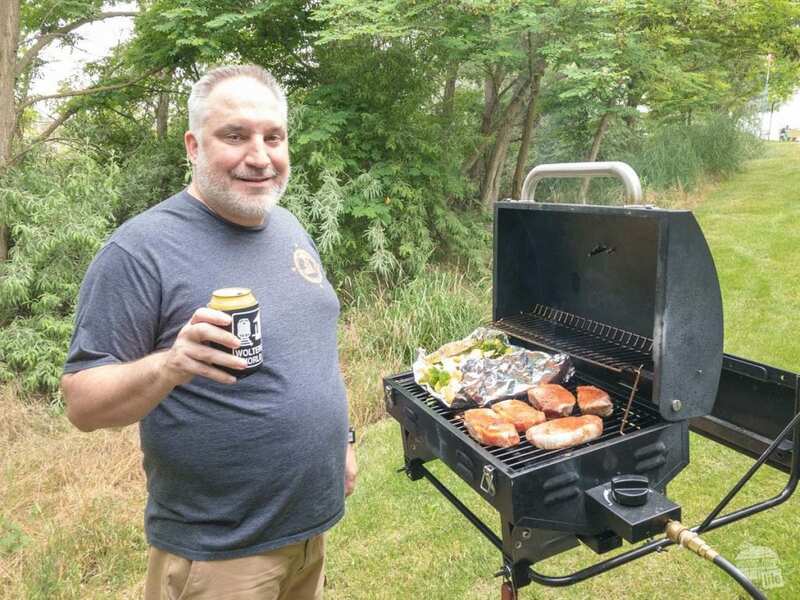 At the age of 70, and 48 years of marriage, my husband finally got senile enough–ha ha–to give in and let me start camping. He has a large touring BMW motorcycle and I knew toy hauler/camper would sweeten the pot. First, we bought our first pick-up truck and I get to drive it around town. Some friends are envious but not many. It was fully equipped for towing what we planned to buy. We are minimalist, we got a toy hauler/camper trailer. We are ignorant and innocent as babes in the woods. 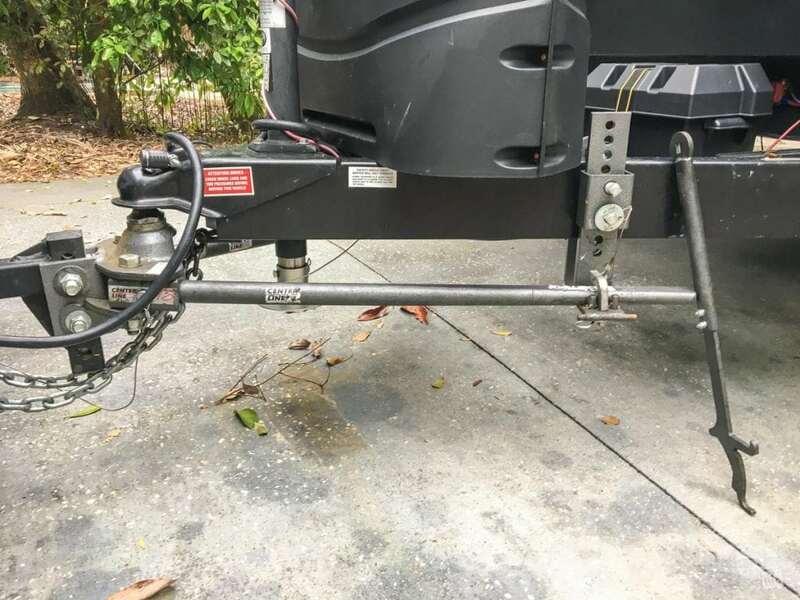 The camper package is very generous, hoses and cords are included and the ultimate selling point was electric levelers and they “threw in” the sway bar. When we pick it up and they demo it I’m going to use your list to check which items we still need to make this undertaking as easy for the Mr. as possible. Also, that interior outfitting list for me—kitchen, bathroom, bedroom–at least what I can’t get along without at first until I decide what our needs are. Thank you, I’m going to add your site to Favorites. I inherited a trailer from my dad, and am trying to figure out how to outfit it to meet our needs. Your site provided me with excellent information. THANK YOU SO MUCH! So glad we could help! Please let us know if you have any other questions! Thank you! Great article. We just bought a class c rv and have never camped. This is so helpful and have used the links to buy several items. Now on to read part two. Thanks so much! Please let us know if there are any questions we can help answer! As for the mosquitos and other pesky little flying biters, have you tried Tea Tree Oil? It will even keep gnats away, believe it or not! I usually mix it in lotion and put it on that way. It may burn a bit if you do not put it in some type of carrier product like lotion or baby oil or coconut oil. Also, you can get Tea Tree oil conditioner and use that as a lotion or rub it in your dry hair and do not wash it out until you are ready to head in for the night. It has a strong, but clean and earthy smell and the bugs do not like it. 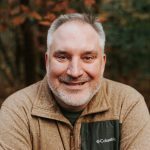 Great article glad I came across it. It has given me some ideas that i did not think about but i do have one other suggestion for you though. 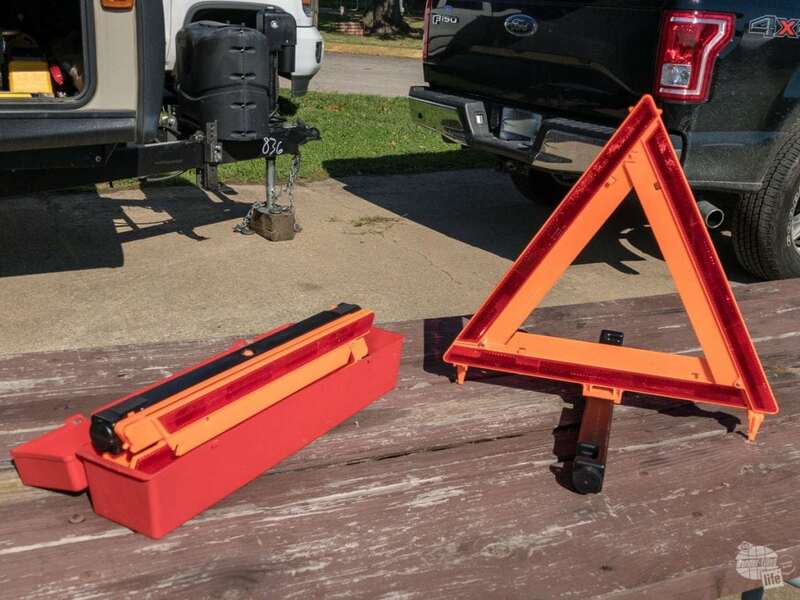 When looking for ideas on leveling my travel trailer i came across levelers made by anderson that are shaped like curved wedges that you basically just drive up on and chock and camper is leveled. No need for all those blocks. thanks again for this article headed over to read the inside one now. Thanks so much Dale! We have looked at those… They look really awesome. Great article, however, my husband has one more suggestion- a padded kneeler. When he has to crawl under the slide-out to drain the gray water and black water tanks, it’s murder to have to kneel in the gravel!